Not since Tony Blair stepped down from high office has Gordon Brown's face beamed so brightly. Sitting with his sons and his brothers, the former Prime Minister joined the massed ranks of Raith Rovers fans in riotous acclamation of a result that sparked jubilation in one section of Easter Road and fury in all others. John Baird's winner, put away on the rebound four minutes from the end of extra-time, lent drama to an otherwise wretched final. Moments after the last whistle, you looked to the Rangers sections of the stadium and they were as desolate as their defence had been when the ball broke loose off Cammy Bell for Baird to thump home the winner. It was a lovely moment for Raith Rovers, who hardly threatened all day. A smash and grab. Rangers had the dominance and most of the chances, but it did them no good. They were short on ideas and woefully short on accuracy. 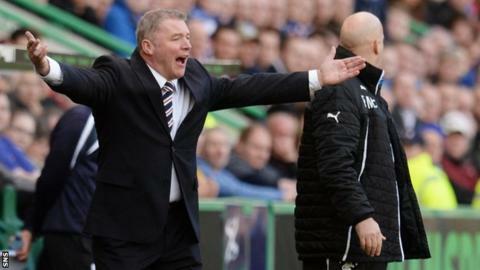 Ally McCoist left the arena looking like a man who had seen a ghost. Maybe he had. Maybe the Rangers manager was having flashbacks. The longer this final went on, the more you thought of McCoist's myriad torments in cup football as manager of Rangers, the track record of failure that had a cherry applied on top here, courtesy of Baird. The convulsion against Forfar in the League Cup earlier this season. The shellackings at the hands of Dundee United and Inverness in the Scottish Cup and League Cup last year and the year before last. The painful exit against Queen of the South in the Ramsdens Cup that went before. The embarrassing loss against Falkirk in the League Cup in 2011 in the pre-liquidation age, a night when Rangers still contrived to lose despite playing a coltish Falkirk while having all their own go-to players on the pitch. The catastrophic losses to Maribor and Malmo in Europe that same season. With five minutes of normal time remaining at Easter Road, the ball came floating across the Raith Rovers penalty area to the back post, where Bilel Mohsni lay in wait, unmarked and favourite to score. In an act entirely in keeping with what went on in the previous 85 minutes, Mohsni made a mess of it, his header flying over and into the Rangers fans behind the goal he had so lamentably failed to trouble. How utterly ruinous that miss proved to be. Mohsni's moment was just one more terrible mistake piled high atop an error mountain that reached high into the Edinburgh sky. With its colours and its noise and its full house, the final looked and sounded like a big occasion, but when referee Kevin Clancy got things underway, the reality kicked in. Two poor teams. Neither with the capacity to unlock the other until that last act. Scrambling defence usually got in the way. Or hopeless execution. Mostly hopeless execution. For all of the opening half - and for much of what followed thereafter - this could not have been any more slapstick had the Three Stooges stood in the middle of the park hitting each other with wet fish. Maybe it improved as time went on - at least there were some chances - but only by a degree or two and only from the stultifying mess it had been in the opening half. An eyesore. Ian Black was emblematic of what went on. It is perhaps unfair to pick out one player above all others for treatment, but Black's deterioration since he joined Rangers has been unmistakable. He has played - and bossed - bigger cup finals than this. The reason Rangers signed him in the first place and gave him such an outlandish wage, in Scottish terms, was because he has done it on a decent stage with Hearts. In that first half, the only leadership and direction Black offered happened to bring Rangers down a dead-end route. His first act was a free-kick that went sailing beyond its target - a pattern that continued. He got the ball and he hit it too long. He got it back and he hit it too short. In Black's head, he must think he is some gorgeous amalgam of Xavi and Andres Iniesta. In reality, too often, he was Mr Magoo. Whatever chance Rangers had of building momentum crashed and burned with Black. It says something about their opponents that Rangers still had the game's best moments despite their terrible deficiencies. Black had a shot tipped over by Lee Robinson in the Rovers goal, Mohsni set the scene for his latter miss by having one earlier from similar range, Stevie Smith had a fine shot turned away by Rovers' goalkeeper. On it went, Rangers trying to play but failing. Raith Rovers attempting to spark something but incapable. Any time a breakthrough threatened, a pass went astray or a bad decision was made. Lee Wallace failed to pick out Nicky Law. Callum Booth failed to hit the target. Mohsni failed - somehow - with that point-blank header and the final carried on into extra-time, what little life it had in it being drained slowly. When Law's shot slapped off one of Robinson's posts, the mind started to turn to penalties, but then Baird appeared on the scene and settled it. Rovers had their win and McCoist had another chapter in the feeble story of his cup experiences while in charge at Rangers. Despite the joyous ructions among the Raith Rovers supporters, it was still possible to hear the eruptions of their counterparts. Boos rang out from the Rangers fans. There cannot have been shock at their side's terrible shortcomings - they have seen this kind of thing many times before - but there was an unmistakeable air of resentment. If some of it - all of it - was directed at McCoist, then no wonder. This was as bad a day for him as it was a celebration for his opposite number, Grant Murray. The Raith Rovers manager left the capital with a trophy in the bag. McCoist departed with a heap of trouble on his hands.